How many times have you ever complained? If you’re like me (a midwesterner) you’ve probably only complained a few times. Or maybe just once at a Perkins when you were 12 because your blueberry pancakes were cold. What we sometimes forget is how valuable these can be to a business. This past weekend, I got some salami from a grocery store deli. The next thing I know there’s a trail of salami falling from my cart as I walked down an aisle. They forgot to close the package and I should have complained but didn’t. So this will probably happen again, meaning more salami trails in the future. 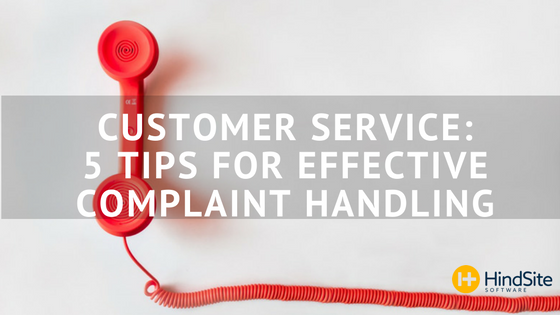 In the next week or will be covering customer service topics, from a list of shocking statistics and facts to this post about how to better handle complaints. Complaints are rare - very rare - for every 100 dissatisfied customers you only hear from 4 of them (meaning 96 don’t even bother). You can learn a lot, about your company, your customers and how to make the appropriate corrections to eliminate reoccurring complaints. Sounds like a lot of work, right? Well it’s worth it, because of those 96 customers who don’t bring up their issue, 91 will never come back. Of course, this isn’t good for business. That’s exactly why how you handle these situations and what you learn from them is important - because at the end of the day it affects your bottom line and reputation. Studies upon studies show the importance of customer service. That’s probably not too surprising to you because at the end of the day we’re all customers constantly experiencing brands, businesses and products. Depending on the customer’s demeanor, the initial shock can sometimes cause you to begin defending yourself (i.e. your business, your service, etc) - sending you into a disastrous whirl filled with confrontation, raised voices and irrational reasoning. Instead stay calm, keep your emotions in check and avoid challenging their complaint. There’s no better time to simply listen and understand what’s driving their complaint. Take a broad perspective and look past their frustration. Yeah, they might be mad, but “why are they mad?”. Be human, be genuine - show the customer you not only value their business but their voice. Clear up any uncertainties by asking meaningful questions that allow you to fully grasp and empathize with what they’re saying. This demonstrates your appreciation. And hopefully the customer will see this as an example of how your company fosters and encourages feedback. Taking this approach to the situation sets the table for an authentic and meaningful apology. Simply saying “I’m Sorry” usually doesn’t get the job done. Most people don’t believe it and even more importantly you might not even mean it. There isn’t a magical antidote - but explaining why you’re sorry while being considerate of their inconvenience or disappointment or even anger - goes a long way. It’s the little things, like these, that eases a situation so an effective course of action can be offered. You don’t need to be Superman. There’s no reason to put that burden on yourself. You don’t need to have all the answers or solutions - offering support isn’t about always being right, it’s about always having the will to make it right. And sometimes that just means listening a little more. The interaction doesn’t end with you offering a solution to the customer. Ask them if they understand, never just assume. And if they don’t get exactly what you’re saying, clear up any misunderstanding. There’s no good in fixing a problem if they have no idea what you’re talking about. It’s basically impossible for a business to progress, grow and better serve their customers, if the attention you give the complaint ends when the conversation ends. Be proactive. Even if you handled the situation perfectly up to this point, you haven’t eliminated the chance of experiencing an identical complaint tomorrow, next week or a year from now. We all know the saying “it’s only a mistake if you don’t learn from it.” That’s pretty applicable here. Record the complaint and its relevant information (i.e. what it was about, actions took to resolve the issue, even how the interaction ended). An efficient process that organizes and segments complaints is great but what’s really important is that you document the event and learn from it. Lastly, after you’ve put in all that work to listen and acknowledge what they had to say, apologize with gratitude, offer support, find and explain a solution, record the complaint and learn from it - it’s time to ice the cake, to top the sundae with a cherry. How, you ask? By considering how else you can provide help and value to a (complaining) customer. For example,you own an irrigation business and a tech heard a complaint from a customer during one of their winterizations. He records the event and tells you about it. You could then contact them the following day to reiterate your company’s willingness to be there for every customer and provide support whenever an issue arises. It’s a pretty simple act that doesn’t require too much effort. When it comes to effectively handling complaints it’s all about your company fully embracing the right approach. If each and every person is committed and understands the importance of providing great customer service, your business’s bottom line and reputation will reap the benefits.